Students and museum goers listen to talks by members of the New Horizons team during "Pluto-Palooza," at the American Museum of Natural History in New York. The New Horizons space probe will make its closest encounter with Pluto on July 14. NEW YORK -- With the New Horizons space probe only two months away from its close encounter with Pluto, the mission team is hosting Pluto-centric events around the country. About 250 students and museum-goers gathered in the Rose Center for Astrophysics at the American Museum of Natural History in New York to hear members of the New Horizons team discuss the first space mission built specifically to study the dwarf planet Pluto. In the past month, New Horizons has hosted Pluto-Palooza events in California and Hawaii, and the next one will take place in Denver on June 20. 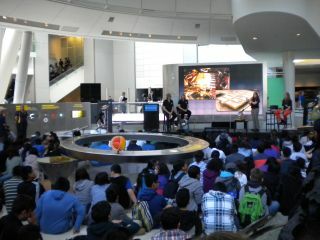 Cathy Olkin, deputy project scientist for New Horizons, speaks with students during the "Pluto-Palooza" event at the American Museum of Natural History in New York. Speaking at the event here in New York, in addition to Olkin, was Mark Buie, co-investigator for New Horizons, and Tiffany Finley, a member of the science operations team. The group discussed some of the science that the mission will address, the design of some of the instruments on board and how the team will manage the close encounter with Pluto. You can watch a video of the event on Space.com. Finley and her colleagues are working on coordinating the "dance" among the instruments on board the probe. During its close encounter with the dwarf planet, the probe will rotate, giving different instruments the opportunity to collect data. While most of this work has been planned and scheduled in the years leading up to the encounter with Pluto, Finley said she and her teammates will be on hand to make changes based on what happens. The team did rehearsals with the spacecraft in 2012 and 2013. Now, the real event is less than nine weeks away. At the event, employees of the museum said that they will be using real data from New Horizons in a software program called Open Sky. Free to the public, the software will show the probe in its approach of Pluto, as well as updated images of the dwarf planet's surface. Artist's illustration showing NASA's New Horizons spacecraft approaching Pluto and the dwarf planet's largest moon, Charon. The debate over Pluto's planetary status has taken center stage in the last decade, but at the museum event, members of the New Horizons team said they wanted to focus public attention on a more important point: Pluto is a very cool place, and New Horizons is going to tell scientists a lot about it. Far from being a cold, dead rock, Pluto is a body with active geological processes and an atmosphere. Even though it lies more than 3 billion miles from the sun, it is illuminated by about the same amount of sunlight seen on Earth shortly after sunset. It's also a member of the Kuiper Belt, a group of objects that have hardly changed since the formation of the solar system, Buie told Space.com after the presentation. Pluto and the other objects in this region will offer scientists new information about how the solar system formed, he said. During its closest approach to Pluto, the probe may be able to see new moons or a ring system. After this flyby, mission leaders say they hope to select another object in the outer region of the solar system, called the Kuiper belt, to fly by and study. Editor's Note: This article was updated to correct the following: AMNH is releasing software, not videos, built using data from the New Horizons probe.